Edge-to-edge display, device thickness, battery drain and creating a 360 degree hinge that clicks in place. Balance larger screen sizes, with in-hand comfort. The Spark: Upon seeing flexible screens I came to the realization, we can split the screen from the rest of the hardware. Based on this, I quickly came up with an idea for a smartwatch. The initial concept was to spread the computing power behind the wrist. After 10 minutes, I had made a handful of prototypes out of nothing more than paper and tape. I tested them out and quickly learnt that it was too uncomfortable to have hardware behind the wrist (especially when working at a computer). I disproved the viability of the concept, but now I was in the zone. The Watch: I wondered how a watch could completely replace your phone. Well, it'd have to be able to detach from your wrist and it'd need the ability to increase in screen size. After being satisfied with the feel of some paper prototypes I moved on to creating versions out of duct tape and business cards and attached them to my wrist. This worked well because instead of making a ton of prototypes to find the appropriate size, I made one I could easily adjust, simply by sliding in one more business card at a time. I printed out some screens, taped them on and showed the concept to people. After seeing this, I learned that people wanted a phone that could increase in screen size. However, they would never wear it as a watch. 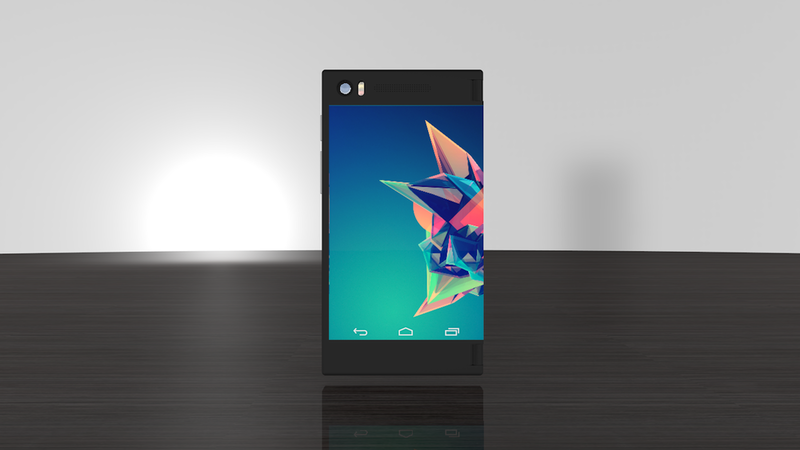 This is when I pivoted to designing a phone. Since, cameras are the thickest component, I tried a deep header. 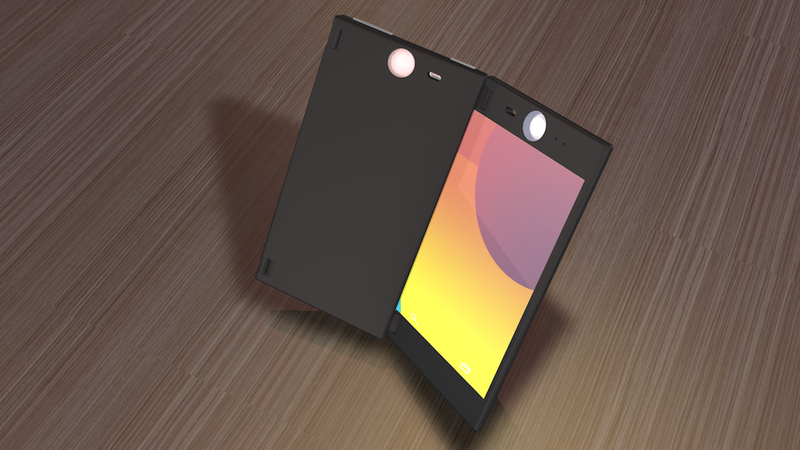 A Foldable Phone: Getting the entire device to be truly flexible (rather than just the screen) was a long way from being economically viable (at the price point the market needs). Even if it comes faster than I predicted the non-flexible device would still be cheaper as it was built on technology already being used at mass in the market. Therefore, I believed it was more of a design challenge then a pure technology challenge. A hinge mechanism clicks side panels behind center screen enabling edge to edge display. The Constraints: Armed with this belief, I moved on to creating higher quality prototypes out of cardboard that would try to solve some of the fundamental challenges. These include: edge to edge display, device thickness, battery drain and a 360 degree hinge mechanism. While simultaneously trying to nail the user experience. I was designing for the technology of the future which meant researching and learning about many diverse future technologies way before they came to market. Dissecting Devices: Since I was a kid, I've always loved taking electronics apart and putting them back together. So it was a no brainer to me. In order to design a phone, I'd have to take apart and analyze other phones along with many other contraptions. I took apart (and often reassembled), phones, cameras, computers, watches, toys, anything with interesting mechanisms I could learn from. I researched how these items were built as I wanted to understand the manufacturing constraints. I came up with a three panelled device, targeted at phablet users. When unfolded, the screen is similar to a 10" tablet. The three panelled device is better suited to the phablet user. When fully unfolded the dimensions are similar to a 10" inch tablet (or iPad mini). In a similar fashion to the 2 paneled device (seen in the video above) the camera is separated from the lens. However, because there is a 3rd panel two distinct lens can be installed. Such as one that is better suited for taking close ups and one for distance. New Use Cases: There are many experiences that this new form factor enhances over existing devices. For example, have you ever had to crowd around looking over someone's shoulder to get a glimpse at some shared video. Well now you could simply share the video in two opposing directions. Games present an interesting opportunity where multiple players could play simultaneously (e.g. battle ships). When taking a picture, both the photographer and the subject can see what the picture will look like as it's taken. There are many more of these new use cases. Getting To Simplicity: Putting the 3D printed device with different screen mock ups into people's hands made it feel much more real then any rendering could have ever done. Despite coming up with the two panel device, I was initially apposed to it over the three. Unfolding to the size of an iPad, did a better job of grabbing peoples attention and initial desire. However, putting them both in people's hands, getting them to play with it showed just how much people preferred the two panelled device. I could have never learnt this from showing images. Once I learned this, I uncovered many more benefits of the two panelled device. Using existing software the device can detect what side the user is looking at and only use this display. However, apps can activate both screens. The larger combined screen can be utilized for many things such as reading a novel or watching a movie. The camera has been separated from the lens, each in the opposing panel. When the device is folded the lens and camera align. This allows each panel to be very thin (as neither must house both camera & lens), while not sacrificing picture quality. Due to the folding nature of the device the single high quality camera can also be utilized for self portraits. This is more space and cost efficient then the standard method of installing a cheap, secondary, front facing camera. Here you can clearly see the power and volume buttons ( + and - are in one button). 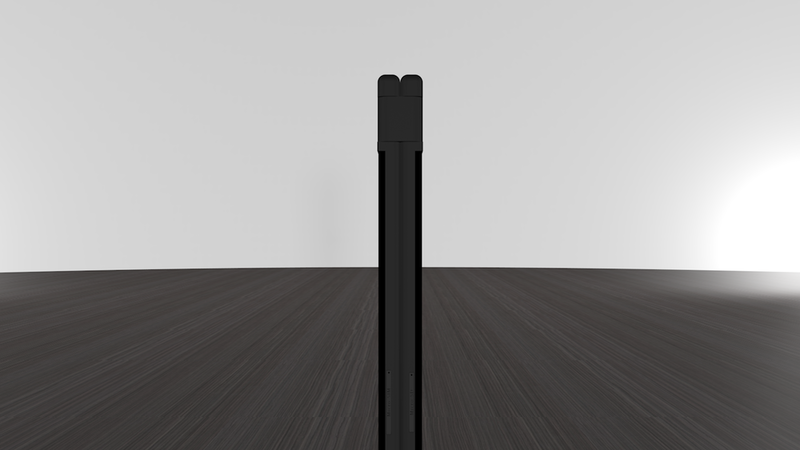 The 360 degree hinge can snap in and out of place at 180 degrees. Since the Sim and SD card slots are rarely accessed, they are positioned on the joint side. When unfolded the device can mimic surround sound as it has speakers on the far corner of each panel. The device is quite thin even when folded. Phone Mode - When the device is folded to have a screen facing both directions. Using pre-existing software the device can detect which screen the user is looking at and only this display will be used. However, an app can activate both screens. Display Mode - The device is unfolded to have the two screens flush together (our hinge clicks into place when flush), acting as one larger screen. The larger combined screen can be utilized for reading a novel, watching a movie or many other activities. When unfolded the screen dimensions are close to a 7 inch tablet (or iPad mini). 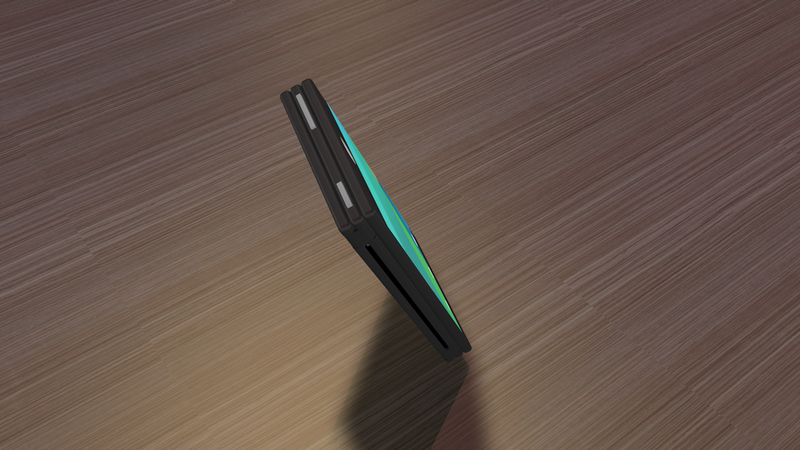 Shell Mode - When folded, to have both screens facing inwards, the device is in a more durable position. This is because only the metal back of each panel is exposed. This durable shell mode can be useful for many activities where the phone might be damaged (e.g. biking) or simply to avoid scratching the screen (e.g. loose in a purse). Often the larger lessons sound obvious and if you asked me before hand I might have said I already knew these lessons. However, it's one thing to know a concept, it's an entirely different matter to put it in to practice. Test with less: if you think your being scrappy and testing with the bare minimums you can probably still cut. Nothing compares to having it in your hands: things always seem simpler in your head, on paper or on the screen. You likely won't notice many of the breaking points until you actually have the product in your hands. So do whatever you can to speed up the time between thought and in-hand product. "The art of simplicity is a puzzle of complexity" - D.Horton. Everyday people take for granted simple products, never wondering how hard it was to get them there. Getting to simplicity is deeply challenging. This project has given me a new appreciation for the simple things and curiosity to understand what it took to get them there. Venture developed in 2013 i.e. started when iPhone 5 (4 inch display) was latest iPhone. Not shown here is the internal mechanical and electrical engineering.